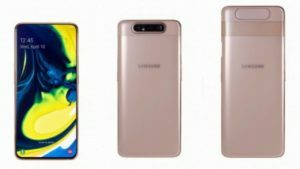 Samsung Galaxy A80 triple-lens rotating camera phone has recently launched by the branded Smart mobile Company Samsung. It is the first smartphone that comes with a latest feature rotating camera. It is a notch-less device that ditches the punch-hole cut out and approve an unfamiliar rotating pop-up triple lens camera. It also comes with the rear camera to selfie. Samsung Galaxy A80 rotating camera includes a 8 MP f/2.2 3D depth sensor with an ultra-wide 173 degree and its main 48 MP f/2.0 lens with the highest resolution sensor. 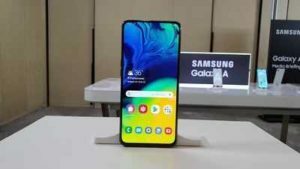 Samsung Galaxy A80 triple-lens camera smart phone is a newly designed from Samsung and it seems entirely different from any other smart mobile. Whenever you will click to the selfie mode in the camera app, then the camera section slides up and the rear camera automatically rotates 180 degree from back to the front. This entire process happens in a moment. When the camera app is shut then the entire part gets hidden inside and the camera automatically gets rotated front to the back. This mobile equipped with Samsung’s “Super steady” video mode, an AI powered Scene optimizer and a Flaw Detection features that deceptively, automatically identifies problems before you click. Moreover, Samsung Galaxy A80 triple-lens rotating camera smart phone has a metal frame with a 3D glass. It comes with a 6.7 inch Full HD + supper AMOLED infinity Display without any notch. This smartphone is powered by the latest Qualcomm Snapdragon 730G octa core Chipset. 2 cores clocked at 2.2 GHZ and other 6 cores 1.7 GHZ. It runs Android 9.0 Pie based operating System. It has 8 GB RAM and the internal storage is 128 GB and there is no any SD card slot to extends internal storage. There is an ultrasonic fingerprint scanner in the display itself and the Samsung Galaxy A80 rotating camera Smart phone powered by a 3700 mAh battery with 25 W fast charging supports. It supports all connectivity like as WI-FI, GPS, Bluetooth but there is no face unlocks support. It will be available soon in the Global market with the least price and three main colours Black, Gold and White.